★ Announcing Lumo Play 4! ★ Announcing the Lumo Play 4 Beta! For those of you who tested the Lumo Play 4 Beta, thank you for helping us make it as good as it can be. We are very excited to announce that the new version of the Lumo Play 4 application has been released August 7th! Choose the setup that looks closest to your equipment setup and the rest of the calibration process will be optimized with pre-sets for that specific equipment setup, making it easier to get things up and running as quickly as possible. Calibrating your camera is the hardest part of setting up a Lumo Play installation. That's why we've added tutorial videos every step of the way through the calibration process to help you out if you get stuck. You will find the videos during every step of the calibration process in the Lumo Play software. You can also find the full-length videos in our help section. By moving away from Adobe AIR, the application stays stable over long periods of continuous use. You'll spend less time waiting on loading screens and the calibration controls are much more responsive. Lumo Play is now multilingual software! English, Arabic, German, Spanish, French, Japanese, Korean, Portuguese, Russian, Chinese. Resources for you to code your own remote control application for Windows computers and tablets. Use filters to only show you the games that you want to see. Show: All, Motion Maker, Floor, Wall, Wall Ball, Touchscreen. Leveraging the power of the Unity 3D engine we can now deliver high-quality games with 3D assets! 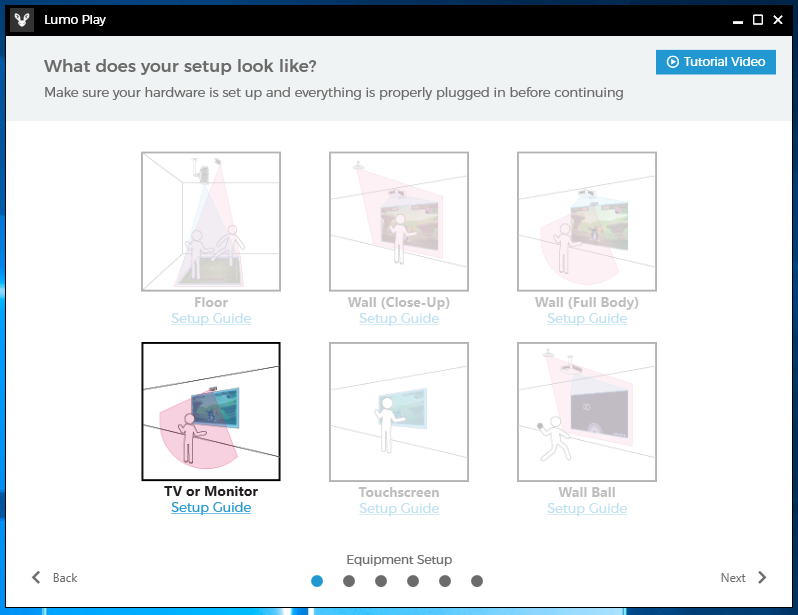 An interactive playlist menu available for all installation setups. Run a playlist, after a game ends the Game Gallery menu appears giving the user control to choose which game to play next. For customers who are just getting up and running, you can download and install the new software from your account dashboard. If you have a previous version of Lumo Play and want the new software right now, just download and install the new software from your account dashboard The manual update will take care of the rest. To learn more about using Lumo Play, see our documentation in our Guides section. When updating it seems to forget a license is installed on the machine. This now means the license needs deactivating but can't be done as the software won't load without one. If updating I would deactivate license first. The new version of Lumo Play changes how (and where) license data is stored on the local computer. Previously all license data, games, playlists, etc... were saved inside each individual Windows user's account settings. This meant that for multiple Windows users on the same computer you would need multiple licenses, or you would need to create a shared user account that everyone would use to run Lumo Play. Lumo Play 4 moves the license, game cache, playlists, etc... into a common shared directory, making it accessible to all Windows users registered on the local computer. We designed the new version to automatically detect if the user installing the new version has an existing Lumo Play license, and if so, migrate it over to the new location and new format. This means you don't need to deactivate your license when installing the new version, provided you're installing it while logged-in as same Windows user account that you used with the old version of Lumo Play. If you encounter problems upgrading to Lumo Play 4, or find that your license data is not being migrated properly, please contact us about the problem. Thanks for the update. This was installed on a system with only 1 user as the system is dedicated to being used for Lumo Play. I think something has gone amiss when upgrading from 4.0.3 to 4.0.4 as the data was not moved. I am now dealing with your AMAZING (and I mean that) customer support team.